Cisco and InformaCast provide K-12 schools with a powerful, easy-to-use emergency notification system. Real-time video, panic buttons and messages to police radios can all be configured to ensure rapid response times and informed decision making. 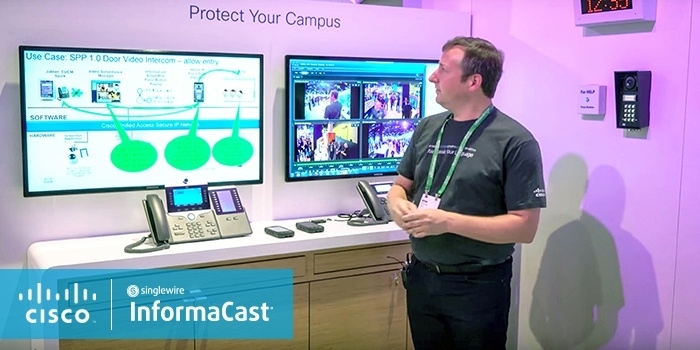 During this year’s Cisco Live event, Kevin Holcomb, Technical Marketing Engineer for Cisco, recorded several videos demonstrating how K-12 schools can enhance security with Cisco and InformaCast. With emergency notifications that can be sent in multiple formats to devices that include mobile devices, video displays and more, InformaCast helps schools maximize the potential of their Cisco phones. Many schools have a single point of entry, but do not employ best practices for allowing visitors into the building. Cisco phones with InformaCast can tie into intercoms that have built-in cameras. When a visitor requests entry, staff inside the building will receive a notification on their mobile devices and Cisco desk phone. When the call is answered, staff will see the intercom video feed and can ask why they want to enter the building. They can then unlock the door from their Cisco desk phone or deny entry. If they deny entry, a message is sent to speakers and displays to alert personnel. Security displays will automatically receive the video feed. This provides security officers with real-time tools to make informed decisions, instead of simply reviewing footage after the incident occurs. Educators should have access to tools that keep themselves and their students safe in the classroom. InformaCast can create single-touch panic buttons on Cisco phones that make it easy for teachers to reach security personnel. When the panic button is pressed on the Cisco phone, a message is sent to administrators and/or resource officers requesting assistance. Cisco and InformaCast can then push the closest video camera so they can review footage in real-time. InformaCast is also able to send alerts to phones, speakers, computer desktops and Jabber devices to reach security personnel wherever they are. The message can be customized to include the room number, as well as pre-built messages with specific details and a room call back number. Recipients have the option to listen in silently to know what is happening in the room, or reach out to teachers in nearby classrooms to check on the situation. With Cisco and InformaCast, schools can connect directly to police radios for instant communications during an emergency. Schools can set up messages through InformaCast that include information such as the school’s name and address using Cisco Instant Connect to send messages over police radio frequencies. This direct line of communication reduces response times to begin managing emergency situations.